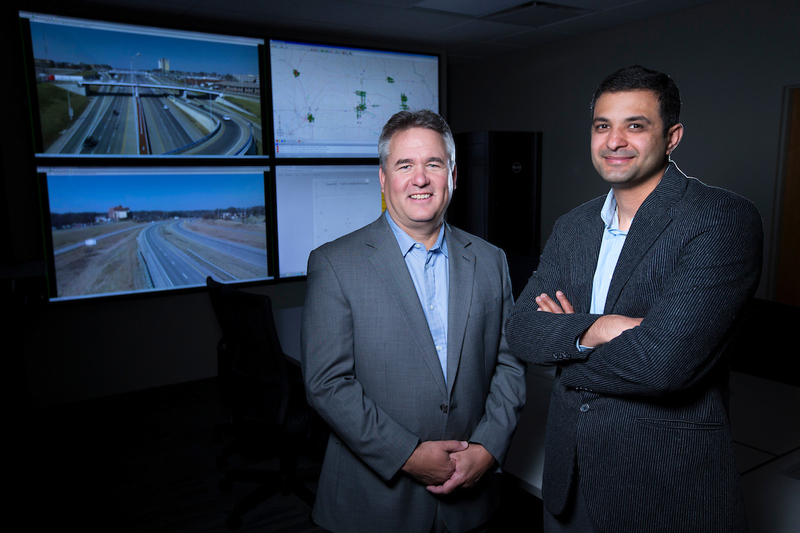 Iowa State's Neal Hawkins and Anuj Sharma, left to right, are using the REACTOR big data lab to help develop a smart system to help detect and manage traffic incidents. Larger photo. Photos by Christopher Gannon. AMES, Iowa – The traffic data hits the REACTOR lab in continuous streams from across the state – video, traffic volume, speed, backups, weather and more. 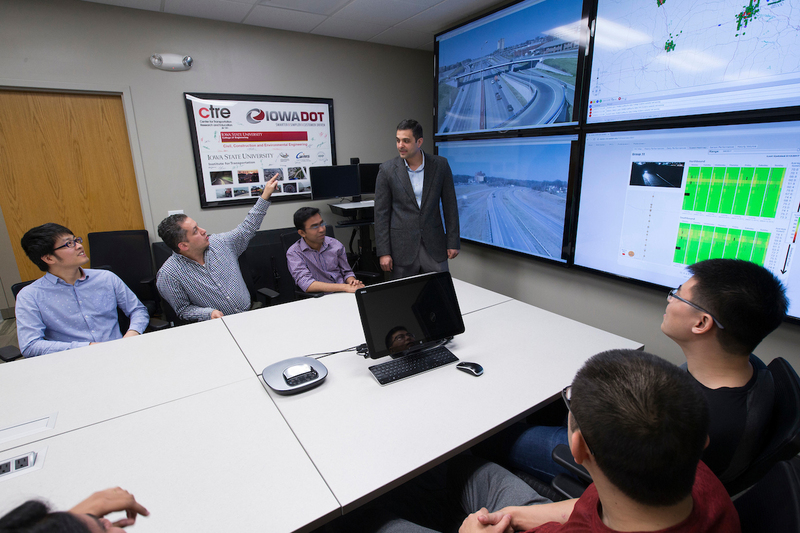 Iowa State University researchers can call up all that data on the six big screens arranged around the Realtime Analytics of Transportation data lab, or REACTOR. The lab is part of the Center for Transportation Research and Education within Iowa State’s Institute for Transportation. It features a fiber optic connection to the Iowa Department of Transportation’s Intelligent Transportation Network. University engineers are helping the Iowa DOT by taking the data, analyzing it, making sense of it and finding ways to support improved decision-making, Hawkins said. One example of putting the data to use is development of a smart system for managing traffic when there’s a crash, a stalled vehicle or bad weather. Iowa State researchers are calling the system they’re developing TIMELI, or Traffic Incident Management Enabled by Large-data Innovations. “The goal and outcome of TIMELI is to use emerging large-scale data analytics to reduce the number of road incidents through proactive traffic control and to minimize the impact of individual incidents that do occur through early detection, response and traffic management and control,” the Iowa State researchers wrote in a project summary. Anuj Sharma – an associate professor of civil, construction and environmental engineering, a research scientist for the Institute for Transportation and the leader of the TIMELI project – recently pulled out his laptop and called up an example of the problems the new system is designed to solve. His computer showed Iowa DOT video of Interstate 235 in Des Moines, near Polk Boulevard looking east toward Roosevelt High School: Traffic is heavy, but moving. Then there’s a crash in the right lanes of the westbound interstate. It’s hard to see the crash at first, but then traffic starts backing up. At the Iowa DOT’s traffic incident management center in Ankeny – staffed 24 hours every day and tasked with scanning traffic and spotting problems across the state – an operator took a few minutes to spot the growing traffic problem a few miles west of downtown Des Moines, call for help and post warnings to traffic message signs. So why hasn’t some kind of automated system been developed to help monitor all that traffic data and quickly find problems? Sharma means that literally – advancements in machine learning will allow the TIMELI system to learn from experience and find ways to do a better job analyzing the Iowa DOT’s data streams, finding incidents and maybe even predicting problems. To make the TIMELI system work, a team of Iowa State researchers is working to develop new traffic models, computer algorithms, user-friendly computer displays and information visualizations that will help operators make decisions and take actions. They’re also using big data technologies to design new systems for data handling, archiving, analysis and output. The researchers’ work to develop TIMELI is supported by a three-year, $1 million grant from the National Science Foundation. Their goal is to develop a prototype of the system using the REACTOR lab as a test bed. The prototype would also be tested and evaluated within the Iowa DOT’s Traffic Management Center in Ankeny. They hope the system will improve incident detection and support operator decision-making – ultimately improving safety and mobility for Iowa’s transportation system. Most importantly, a working, robust TIMELI system could help every driver on the road. “Use of the system by state DOTs can reduce the duration and impacts of incidents and improve the safety of motorists, crash victims and emergency responders,” the researchers wrote. Iowa State traffic researchers are developing technology that will take the huge amounts of data collected by the Iowa Department of Transportation, sort through it all and identify problems. The goal is early detection of traffic incidents and better traffic management. That would improve safety and mobility on Iowa's roads and highways. In addition to Anuj Sharma and Neal Hawkins, the research team includes Baskar Ganapathysubramanian, an associate professor of mechanical engineering; Stephen Gilbert, an assistant professor of industrial and manufacturing systems engineering and an associate director of the Virtual Reality Applications Center; Chinmay Hegde, an assistant professor of electrical and computer engineering; Skylar Knickerbocker, a research engineer at the Center for Transportation Research and Education; Adarsh Krishnamurthy, an assistant professor of mechanical engineering; Soumik Sarkar, an assistant professor of mechanical engineering; Srikanta Tirthapura, a professor of electrical and computer engineering; and Umesh Vaidya, an associate professor of electrical and computer engineering.